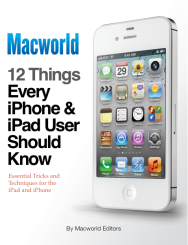 Macworld’s April 2012 magazine feature, “12 Things Every iPhone and iPad User Should Know”, is now available as an enhanced iPad edition on the iBookstore for $2.99. The feature has been redesigned using iBooks Author for iBooks 2, and features additional text, exclusive videos, animations, and photo galleries. While using an iOS device isn’t hard—and that’s partially why we love them—even savvy users like Macworld readers have holes in their iPhone and iPad knowledge. Maybe you know everything there is to know about Safari caching, but you’re in the dark when it comes to iPhone photography. Or perhaps you’re a Mail maestro, but you’d like to be faster at composing emails on a digital keyboard. Whether you’ve forgotten an iOS trick or you want to learn some new ones, our editors have you covered. 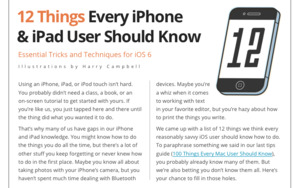 We polled our community—and our newsroom—to create a list of 12 essential iOS features we think every iOS user should know about. Topics include syncing your accounts and data, managing your apps, printing, and working with Bluetooth. You can learn how to troubleshoot meddlesome battery issues and brush up on your security and backup options; we’ll also explain the basics of multitasking and editing text, and walk you through shooting a quality photo and working with PDFs. 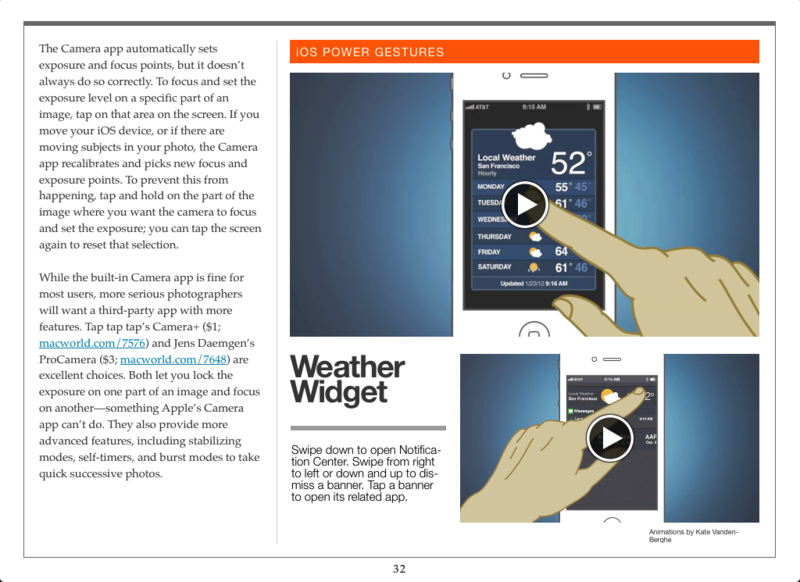 These iOS essentials first appeared as the cover story for our April 2012 issue; as we put it together, we realized that it would be the perfect story to translate into Apple’s new iBooks Author format for the iPad. (A story about iOS devices on your iOS devices? Makes perfect sense!) Not only does the book include all the information from that print feature, we’ve redesigned the layout, included new galleries and videos, updated information to include changes in iOS 5.1, and added a little bit extra for our ebook readers. You can download 12 Things Every iPhone & iPad User Should Know for $2.99 on the iBookstore; it requires an iPad running iBooks 2 or later. While you’re in the iBookstore, check out some of Macworld’s Superguide titles, including our iPhone 4S Superguide and iOS 5 Upgrade Guide.